Description of "Narada Bhakti Sutra"
Bhakti is a very special attitude. It is a rare kind of lifestyle. It requires tremendous guts, large-heartedness and purity of vision. Narada was an adventurer from long ago, who exemplified the qualities of a Bhakta. We have heard the famous quote – Beauty lies in the eyes of the Beholder. This is what Narada lived. To him each and every one was divine, so he extended his hand to the cruelest sinner and to the most benevolent king. He went out of his way to have a dialogue with serpents and goblins - braving harsh mountains and rough weathers - demons and despots, commoners, officers, soldiers, saints and children. Narada exuded such warmth and caring, he brought such innocence and spontaneity in his wake, that he not only infused his surroundings with vitality, but also imparted a measure of grace. This is the story of the values he lived, that an ancient sage penned down. It has come down to us as priceless nuggets evoking awe and inspiration. It has the charm of taking us on a journey to freedom. Intrinsically in this state it is the highest , purest love. For the students of Sanskrit grammar, copious notes giving the case of each word have been clearly listed. 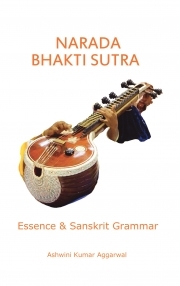 Reviews of "Narada Bhakti Sutra"